Romero’s Metanoia Experience comes to Preston! On 10th November 2017, a packed St.Wilfrid’s Church in Preston witnessed the dramatic production of, ‘Romero- Heartbeat of El Salvador’ brought to us by RISE Theatre. The play told the story of Blessed Oscar Romero who became Archbishop of San Salvador. He was assassinated on Monday March 24th 1980 as he was celebrating Mass in the chapel of the Divine Providence cancer hospital where he lived. The story of Blessed Oscar Romero is a compelling account of the power of conversion or Metanoia, transforming him from a scared Priest; feeling it was not his role to speak out in the name of Jesus Christ about the many injustices which beset his country; into a courageous disciple of Jesus Christ, enthused by the Holy Spirit to denounce the violence, cruelty and injustice which surrounded him. It is fitting that Metanoia Project invited Rise Theatre to stage the production at St. Wilfrid’s (Thanks to Fr. 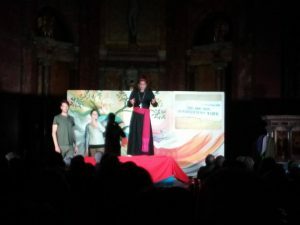 Stephen Patterson), as those who watched the play were challenged to their own Metanoia, to leave behind our lives of comfort and make a decision to follow Jesus wherever he is calling us. If you feel that Jesus is calling you to experience the joy of Metanoia, then please get in contact with us so that we can help you along the journey. As disciples of Jesus, we may lose everything we hold dear, even our lives, but nothing will ever come to close to the joy of knowing and following Jesus, a joy which lasts forever! !